The large dorsal fin of a male Orca nears a fishing boat to have a closer look off Northern Vancouver Island in British Columbia, Canada. Sunset falls around a fishing boat off Northern Vancouver Island in British Columbia, Canada as it stops to have a look at a large male Orca. The perfect way to end a long day of fishing is to sit in the glowing rays of the sun before it disappears over the horizon and watch Orca in their natural environment. Sunset is the best time to be on the water off Northern Vancouver Island where you are amongst beautiful scenery, marine mammals and the magnificent colors of the sky. The ocean is so peaceful at this time of day that you can hear the blow of an approaching Orca for quite a distance. 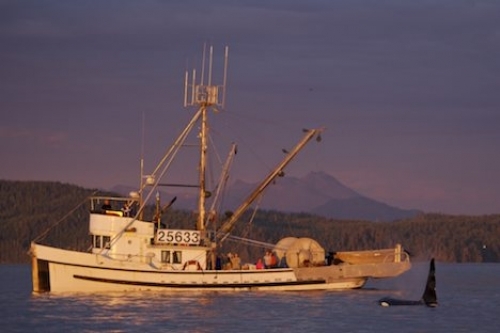 A fishing boat should cut the engines when an Orca is near and let the Orca come to them to investigate. Some of the members of the Northern Resident Killer Whales are fairly social and are curious to see whose is on board the fishing boat as much as we are to identify the male Orca.